Final Fantasy XIV‘s free trial will no longer be restricted to a 14-day period, and will instead allow permanent open access to all players until they progress up to a certain point, developer Square Enix has announced. That may sound like a relatively small change on paper, but the restructuring now essentially means that, besides having to purchase a copy of the title, a sizeable portion of the MMO is now free-to-play. The catch is that, once you reach level 35 with any or all classes, you’ll be required to pay the usual monthly subscription fee in order to progress further, but prior to achieving that milestone, there’s no limit on how much you’re able to enjoy the world of Eorzea. The move echoes a similar decision Blizzard made for World of Warcraft, which allows newcomers to play for free up to a certain point, whereupon they too are required to pay the full subscription fee if they wish to continue playing. It should also be noted that all applicable accounts, including those whose free trial periods had previously expired, are being welcomed back into the fold, regardless of how much time has passed since they were last active. If that has your interest piqued, know that now’s probably never been a better time to jump back into Final Fantasy XIV, what with the game’s second expansion, Stormblood, scheduled to arrive in just a few months. 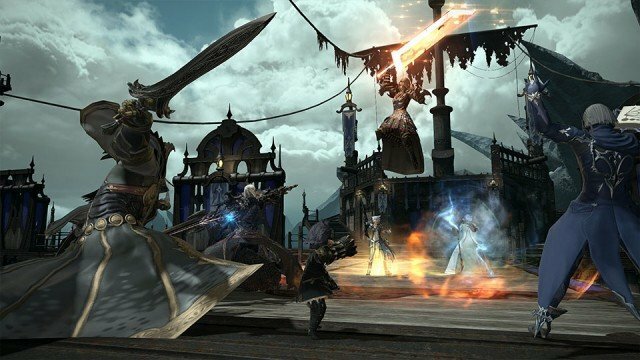 Officially revealed last year, the follow-up to 2015’s Heavensward will add two brand new Jobs – Samurai and Red Mage – as well as new areas, raids, dungeons and an increased level cap from 60 to 70. Square has yet to show its entire hand in regards to Stormblood’s full suite of new features, but expect to hear more details closer to its June 20 release on PlayStation 4 and PC.